Introducing the 1st Palladium American Eagle. Low mintage -15,000 coins. The release of the first 2017 1 oz Palladium American Eagle $25 Coin BU is a significant moment in American coinage. Undoubtedly, which will take the most recognized and demanded American Eagle series into the new field of the precious metals industry. After seven years of studies and development, the US Mint announced that it will launch its first-ever Palladium American Eagle in September 2017. Considerably, one of the rarest precious metals on the market-palladium will join the silver, gold and platinum versions of the famous American Eagles line. This new program will be the first major change to the Eagle program since the release of Platinum American Eagle in 1997. The US Congress authorized the production of the first Palladium Eagle. Under the American Eagle Palladium Bullion Coin Act of 2010. Hence, the newest American Eagle is an extension of the American Eagle bullion series. According to this Act, the coin will be stuck in several versions: Uncirculated, Bullion and Proof. After the Congress passed the Act, the Treasury Secretary commissioned an independent third-party study. So. they went to ascertain the market demand for the new palladium coin. Submission to the Secretary in 2013 for the findings of this study. Furthermore, they were to conclude over the economic feasibility of the coins’ mintage, hence determining their availability. Public Law also includes an option for the U.S. Mint to strike American Palladium Eagles in collector proof and uncirculated qualities. If there is a proof, the law requires that they come from the West Point Mint. What makes the 2017 Palladium American Eagle so special? It’s the 1st official US Mint palladium coin – Only a few mints around the globe use rare palladium in their bullion production, making the Palladium American Eagle a highly exclusive coin. Only 15,000 coins minted! This is a very low mintage, and the coins are likely to sell fast. It carries one of the Nation’s most beloved designs – the “Winged Liberty” considered to be a major factor that will increase the popularity of the coin. This is one of the most beautiful designs from the American coinage. A Proof version of the coin will have a strike from 2018 at the West Point Mint and bear “W” Mint mark. It will have the same design as the 2017 bullion version. The famous “Winged Liberty” design. The obverse side of the coin features the rendition of one of the most attractive designs ever featured in US mintage. Originally created by Adolph A. Weinman for the ‘Mercury Dime”. Also, it is one of the most graceful artworks, featuring the “Winged Liberty” among collectors around the globe. Struck from 1916 to 1945, the “Mercury Dime” coin due to its similarity to the Roman God Mercury. The artwork showcases the profile of Liberty wearing a Phrygian cap – a symbol of power and freedom. Inscriptions include “LIBERTY,” “IN GOD WE TRUST,” and “2017″. The coin’s reverse showcases another creation of A. Weinman, first designed in 1907 for the American Institute of Architects (AIA) Gold Medal. The artwork presents an eagle sitting on the rock and pulling a large tree branch. It is one of the most impressive and admired reverse designs in many years of American coinage history. Note, the proof and uncirculated versions will also display a mintmark. 2017 Palladium Eagle Program Development. The US Mint has worked on securing a reliable list of vendors. Whom shall provide sufficient palladium blanks that meet the Mint’s specifications. The blanks must have sufficient dimensions to ensure the successful high relief rendition of the reverse and obverse designs. The diameter of the 2017 Palladium Eagle shall be between 32.7 mm (the diameter of the gold version) and 38.1 mm (the diameter of the commemorative silver coin). Each US Palladium Eagle coin will be issued with a face value of $25, being legal tender in the United States, and will contain 1 oz. of .9995 fine palladium. Before the production of any coins start, the Secretary of the Treasury must commission an independent third-party marketing study. Into the possible demand for the strikes, the U.S. Mint began researching potential palladium suppliers in 2016. However, the authorizing legislation requires the production of the bullion version of a palladium American Eagle to be at any facility other than the West Point Mint. Yet, the research and development of the palladium American Eagle were from the Philadelphia Mint. 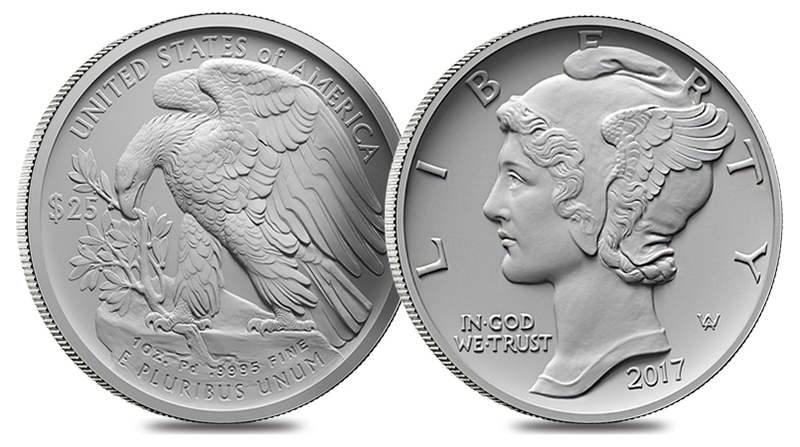 Where the developmental strikes for a palladium American Eagle bullion coin will be struck using dies based on artwork, which was approved by the Secretary of the Treasury. When will Palladium American Eagle be available? First Palladium American Eagle will be available in September 2017. 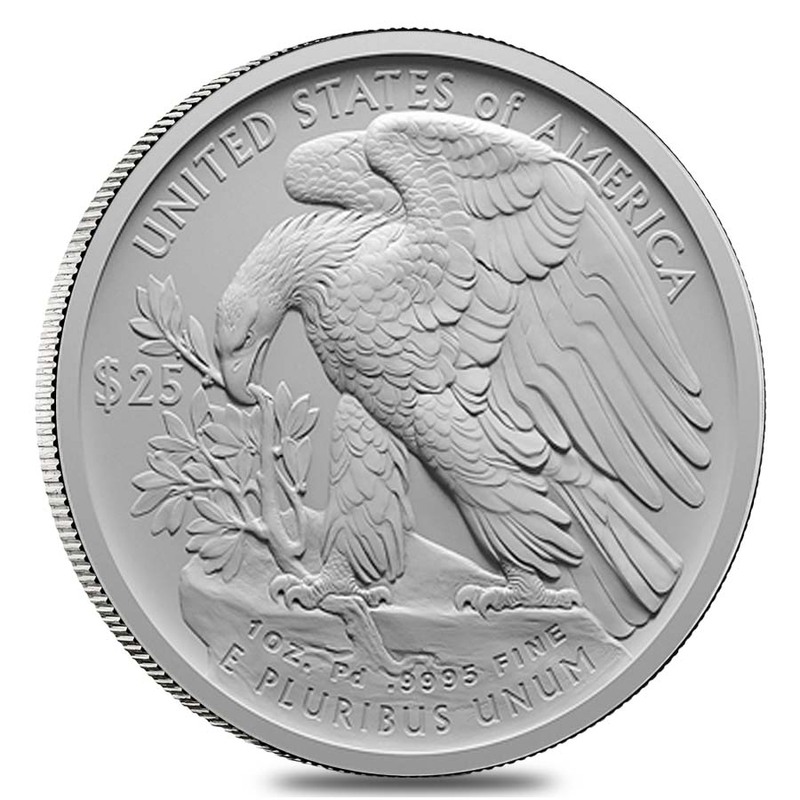 Additionally, like other U.S. Mint bullion, the American Palladium Eagle will be sold in a limited time range on US Mint network and then distribute to authorized retail dealers like Bullion Exchanges. Specifically, the United States Mint has never issued a coin struck in pure palladium. So, this bullion is expected to be one of the most anticipated US Mint releases ever. 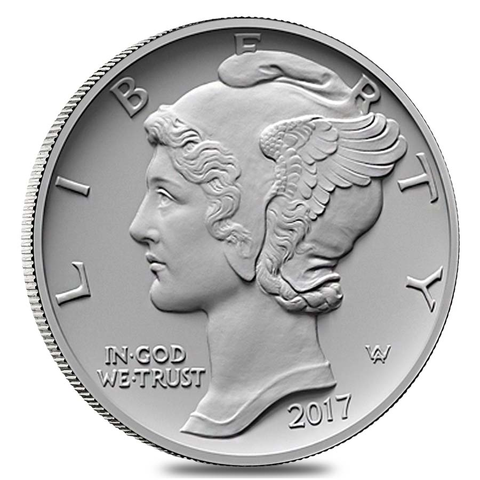 2018-W 1 oz Proof Palladium American Eagle $25 Coin will be available at the beginning of 2018. Don’t miss a chance to buy 2017 1 oz Palladium American Eagle $25 Coin BU on our website. Wish they’d considered making it in a proof. Have they? Please notify me when they are available! Thank you for your interest. According to the official information from the US Mint, proof version of Palladium American Eagle will be also released. You can subscribe to our newsletters, which we also use as the fastest and easiest way to notify our clients about all the new releases and great deals. Thank you! You can buy this product following this link https://bullionexchanges.com/2017-1-oz-palladium-american-eagle-coin !